Olli Mustonen is supremely gifted and plays with courage: the courage of someone who plays with all stops full out, of a pianist unafraid of making a mistake, and of a conductor confident in his musical taste and knowledge. Beady-eyed and provocative, (Olli Mustonen's) opening to the Fourth tells us that it is time to move on from the legendary poetry of Myra Hess, Gilels, Lupu and Perahia and opt for a more invigorating and modernist approach. Mustonen's crisply articulated runs and angular phrasing (...) turn the piano into an individual personality in vivid contrast to the suave cantabile of the orchestra. (...) With excellently balanced engineering and some particularly attractive work form the horns and winds, this is a disc that deserves serious consideration. Mustosen kristallinkirkas, hallittu ja ihailtavan pitkälinjainen avausfraasi saa täydellisen tuen Tapiola Sinfoniettan huippumuusikoilta, jotka ovat oppineet kuuntelemaan pitkäaikaista yhteistyökumppaniaan. (...) Sarjan päätöslevy tuo korostetusti esiin, että Mustosen suvereeni musiikin suunnan ymmärrys ei rajoitu vikkelien osien energialatauksiin; myös hitaissa osissa soitto kantaa kuulijaa minuuttikaupalla. Mustonen brings great energy to his performances, particularly the more rumbustious opening movement of the lengthy 5th, whose colossal aspect clearly offers no obstacles to his abilities. Olli Mustonen osaa soittaa Beethovenin musiikkia juuri niin kuin haluaa. Jokainen sävel asettuu kristallinkirkkaana kohdalleen, jokainen aksentti toteutuu äärimmäisen tarkasti, jokainen tekstuuri soi kuin läpivalaistuna. (...) Tapiola Sinfonietta seuraa Mustosen edesottamuksia äärimmäisen tarkasti, yhtenäisellä soinnilla, vuosien yhteistyöstä oppineena. 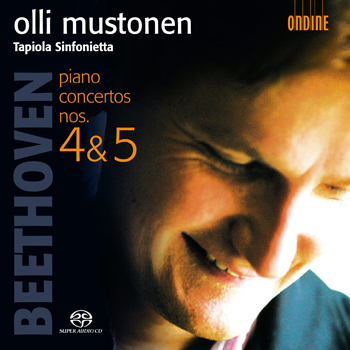 Olli Mustonen crowns his acclaimed cycle of Beethoven Piano Concertos with recordings of the famous concertos nos. 4 and 5. In line with the two earlier installments, he performs these two virtuoso works simultaneously as pianist and conductor - a demanding practice in line with Beethoven's intentions, which can however be only seldom experienced in today's concert life or on disc. Mustonen develops his visionary approach to these works together with the renowned chamber orchestra Tapiola Sinfonietta; together they have toured Europe with this program to much acclaim. The SACD quality faithfully renders Mustonen's incomparable mastery of piano sound and technique. The booklet includes extensive liner notes written by noted Beethoven scholar and author of the new complete Piano Concerto Edition, Dr. Hans-Werner Küthen of the Beethoven-Archiv, Bonn.